Sixteen games into the new season and Johann van Graan has still been unable to select his first-choice backline. It’s the kind of headache that no head coach wants as they enter a new calendar year, but that has been the reality facing the Munster boss. As a result, it has meant that Munster’s attack has been somewhat blunt and with all the firepower at their disposal, supporters will feel that it is high time they saw more of it, particularly in the big games. The win against Leinster could well prove to be a turning point in their season and even though they might have played with a bit more ambition with a numerical advantage, the victory was of far more importance. Felix Jones’ stamp is still waiting to be seen, although Van Graan is understood to have a major say in the implementation of the attacking game-plan. Chris Farrell’s absence has been sorely missed and the powerful centre’s brief return to the starting XV against Edinburgh, before he suffered a fresh setback, provided a glimpse of the attacking force that Munster can be. Joey Carbery didn’t play that game in Irish Independent Park, but even still it was arguably Munster’s best attacking performance of the season, albeit the Scottish side were not at full strength. Van Graan will hope that his side don’t rue not getting a bonus point at home to Castres and while they showed very little in attack the following week in France, it was hardly the kind of game that made for throwing the ball around. A week later in Belfast, it was more concerning, however, as Munster passed up a couple of gilt-edged opportunities when in the ‘red zone’. It was an issue that came back to haunt them in both semi-finals last season and while they undoubtedly have a better squad now, it has yet to all click neatly into place. Conor Murray and Carbery are still gelling as a half-back partnership. They have the potential to explode into life and Munster will need them to, if they are to manoeuvre their way past their remaining two tricky Champions Cup pool games against Gloucester and Exeter. Keith Earls and Andrew Conway are electric wingers, while Munster supporters haven’t yet seen the best of Mike Haley from full-back, but the problem has been getting the slick trio into positions where they can conjure up a piece of magic. On one of the rare occasions that Munster managed to do so against Leinster, Earls lit up Thomond Park, yet the ball that reached him was intended to go to Carbery. In many ways, it typified the struggles to ignite their attack. “No, it hasn’t (clicked), I think they are still finding their way in that regard, to be honest with you,” former player Marcus Horan agrees. “Even the way they played above in Ravenhill, they were defensive. A lot of rugby nowadays is based around defence. You can see that with a lot of teams. Saracens have that wolf-pack mentality and they try and wear teams down. To be fair, Leinster are very good at it as well in the sense that they can see what a team has in the first 10 or 20 minutes and they can withstand huge amounts of pressure from teams defensively. Then when the time is right, they strike and score. “I think Munster are still finding their way with that in regards to getting scores. But then you look at Andrew Conway and Keith Earls and the scoring power that they have. They just need to harness that and get the ball to guys like that. “With the weather improving and as the season goes on with the harder ground, I think it may suit them coming to the business end of the season. 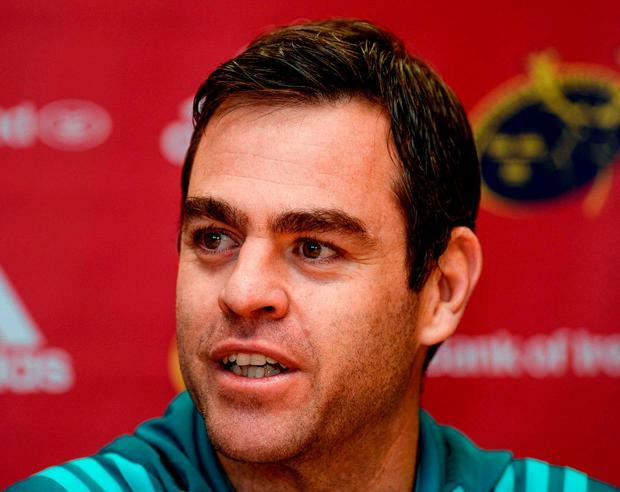 “I think Chris Farrell will have a big influence on their attacking power when he’s back. It’s unfortunate that his return has been broken by another injury. Farrell is expected to feature against Connacht tomorrow, which would be a major boost for Munster’s attacking options ahead of a defining period in Europe. Should he return and come through the game in Galway unscathed, barring any other injuries, it should in theory at least, allow Van Graan to name his first-choice backline in Gloucester next Friday night. It is only then that Munster’s attack should be properly judged.